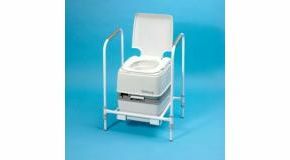 This chemical toilet stand works with AA2410 and AA2411 portable toilets. The stand makes it much easier, safer, and more convenient for disabled or elderly users to use the toilet. Not only does a toilet stand add stability, it also offers a supporting frame with special hand grips to make rising and sitting easier. The risk of slips and falls is reduced, as the frame functions like a toilet grab rail. The toilet stand height can be adjusted to suit the user, and it can be assembled and disassembled without tools, for quick and easy transport or low-profile storage. It packs flat when not in use. Please note: The chemical toilet shown with the stand is not included, but the stand and a portable toilet can be bought together here. A must have additive that we purchased with the Port Potty chemical toilet, raises it up to an easy to use height.